One moment your baby is a pretty infant lying sweetly in their bassinet, the next they’re on the go, caterpillar-ing along on their belly in search of that just-out-of-reach toy. How does that even happen?! If you’re feeling a little unprepared for these small steps (and giant leaps!) we’ve compiled a helpful collection of tips to get you primed for new adventures. Build strength and independence in your baby with plenty of tummy time. Tummy time promotes coordination and muscle development. It also encourages mobility, especially if you place some interesting objects just out of reach. Baby ready to bust out some moves? Make sure they’re dressed in comfortable and stretchy clothing – nothing too tight or too loose – to ensure their cute look doesn’t limit movement and exploration. The optimal mobile baby dress code might just be leggings, bare feet and t-shirts! Too easy. When your baby can sit up unassisted, play games that help develop balance and confidence. You could roll a ball back and forth between you, play peek-a-boo, pass toys to each other (with lots of “thank you” and “please’s”) or practise clapping hands together, for instance. Clear the decks and ensure there’s plenty of space around your baby so they can consider their surrounds and be encouraged to explore. A cluttered space is not only potentially dangerous and full of safety hazards, it also doesn’t allow your baby a relaxed and calm space to move. Let’s be clear, guys! 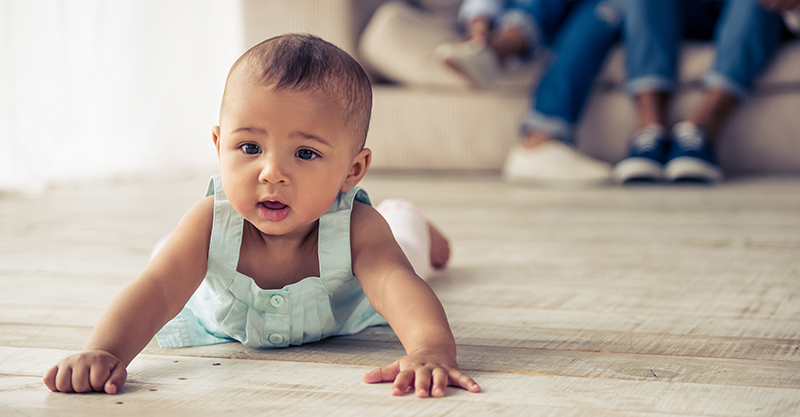 As your baby discovers they can propel their body parts in various exciting directions, encourage them to roll across the floor to give them a taste of mobility – and show them what’s possible. Get down on the floor, cheer them on and have a bit of a giggly roll around too. You’re in this together, after all. If your baby is able to stand, you could encourage them to squat from this standing position. This helps build the strength and coordination required when tackling those not-too-distant first steps. Squat together and you’ll get a little workout too. It’s a win-win! 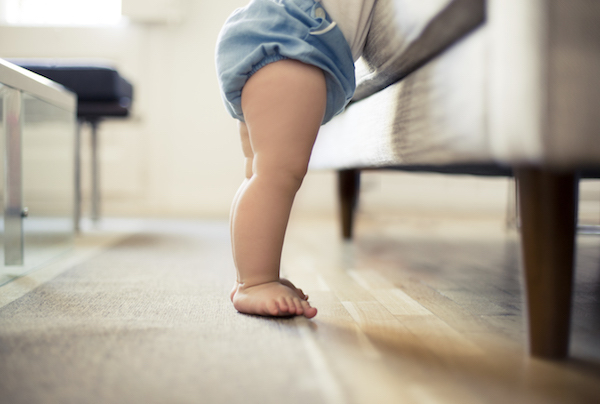 Once your baby is pulling themselves up, they will begin to “cruise” around the room, holding onto furniture for support as they take those first steps. Be sure to provide some sturdy furniture as props to encourage these “cruising” adventures – and remove wobbly or dangerous furniture from your home. Give plenty of encouragement and praise as your baby begins to take risks and increase their mobility. Smiles, cheers and claps will spur them on to independence and confident exploration. This goes for successful attempts at moving solo – as well as mis-steps, of course. Every effort counts. Provide a helping hand as your baby makes those initial efforts to stand up or sit down from a standing position. You can also hold their hands as they toddle beneath you, taking those wobbly first steps. Before you know it, they’ll be doing this solo. Scout your home for possible safety hazards – objects that can fall, cords (think blinds and electrical), poisonous substances, shifting floor rugs, stairs, sharp corners, heaters and the like. It can help to do this from a crawling position and imagine what your baby can see and access. Put dangerous objects or substances out of harm’s way and keep your little one safe and sound. 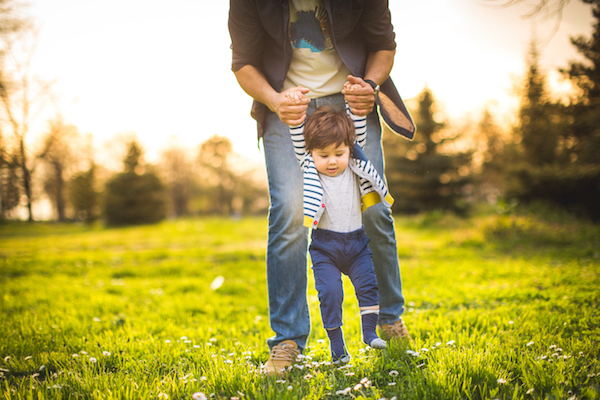 Let your baby go sock-free and shoeless at home as often as possible, so they can get a feel for the ground beneath them and not lose their grip as they practise. Socks and footed onesies can work against these first efforts to get moving, so put them on the back burner for now. 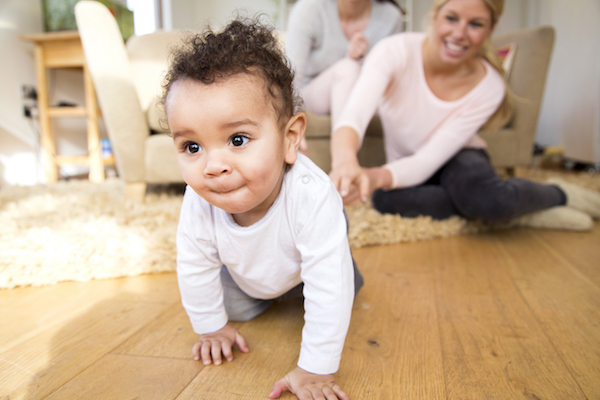 Let your baby’s cues guide you through these exciting, exploratory mobility stages. Never push them to do more than they want and avoid practising sitting, squatting, standing, cruising, standing or walking when your baby is overtired or unwell. These first rolls, crawls and steps are the very beginning of many amazing experiences and adventures you’re set to have with your little one! Have fun together!